Big congratulations to Chris who has been having Driving Lessons in Torquay and has passed his Driving Test first time with only 6 driver faults. Rob Gibson who works for The Driving School sw said “Well done mate I will miss the laughs and at least this time you weren’t called back off of leave”. 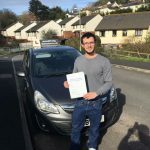 For Driving Lessons in Torquay, Paignton, Brixham, Newton Abbot and all surrounding areas contact www.thedrivingschoolsw.co.uk or call 01803 640607.